As a homeowner one of the quickest ways to make a dramatic change in the appearance of your home and reduce maintenance costs is to have new siding installed. Vinyl siding has become the most popular home siding material used today. Vinyl siding provides many choices for the homeowner, it doesn’t require the maintenance that wood siding does, and can be installed over your existing siding. Many manufacturers of vinyl siding now offer a full range of decorative mill-work that coordinates and enhances the siding project. Decorative moldings, window surrounds, shutters and doors and seamless gutters will completely change the appearance of you home. There are so many colors and styles to choose from, and never needs painting. Vinyl siding never needs painting because the colors go all the way through the material and will never peel, or show scratches or fade like painted surfaces and old aluminum siding did. The siding can be a once and done solution for the exterior of your home. It only needs to be washed occasionally and will maintain its attractive look for 40 years. What a benefit no painting or scraping for years to come. Think of the money saved and painting costs, not to mention sore muscles if you do your own painting. Vinyl siding is done once and your home will look beautiful for years to come. Vinyl siding is attractive, virtually maintenance free, and manufacturers offer a wide range of colors and shades and textures from wood grain finishes to smooth, and allows you to achieve perfect look for your home. For free estimate give the experts at Creative Siding Decking and Seamless Gutters Incorporated a call today or simply fill out the contact form on this page. 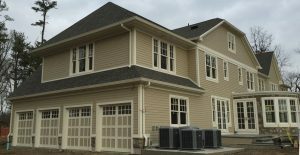 We offer several types of siding from the best manufacturers. Our professional team of siding and gutter craftsman are both trained and certified for installation of all the latest products available the beautify your home.